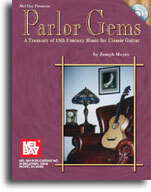 Music selected from the vast repertoire of 19th Century parlor music of the United States and Europe. Features a nice arrangement of the classic Nola. Includes a CD of all the pieces. Music notation onlyNo TAB.